A cold and mighty wind sweeps through the Splinter Sea, dividing the clouds and revealing Dragons in flight. Now in the fullness of time, from the furthest reaches of the planet they have come. For the first time in four hundred years, the Dragons will assemble today in the Field of Glory. 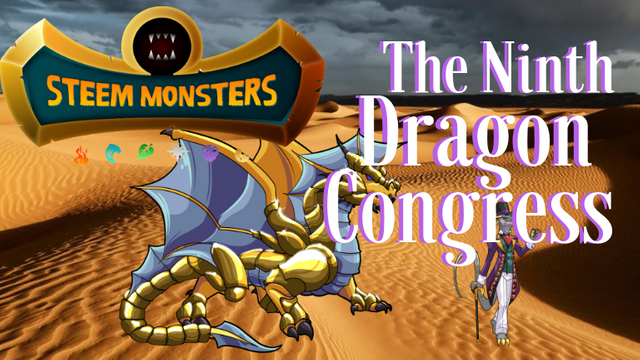 In the sacred sands of Drakh-Nahka, all Dragons are called to a new Congress. Truly the masters of this Splintered planet, Dragons are far greater in number than the Order of the Silver Shield suspects. It is only in these rare times of Dragon Congress that the true scope of their rule can be seen. Dragons do not take kindly to bystanders or eavesdroppers, making them quite difficult to observe, but their passage through the skies can be seen and heard for miles in any direction. 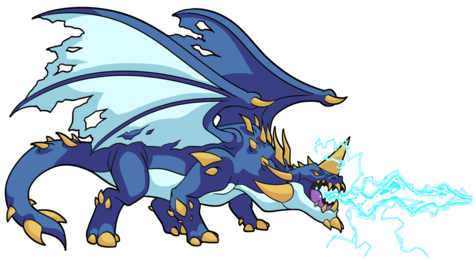 Unaccustomed to group interaction, the wild Lightning Dragons of the east are growing restless while they await the arrival of the more prominent Dragons. As they fly in a frenzied circle just above the Field of Glory, whirlwinds of dust rise in blankets, obscuring the meeting grounds in a brown and golden haze. The Congress will be surrounded by fifty miles of unforgiving desert in every direction, but the Goblins of Gobson are well-known for their attempts to spy on the business of the Dragons, so the “dust flapping” (as Neoxian calls it) is a necessary security measure. High above the Congress grounds, the nameless Golden Dragon playfully chases a rogue Pegasus in the sky. 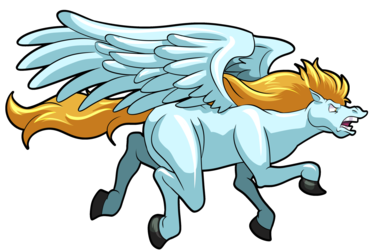 Although few of the onlookers believe the Pegasus will escape, the Dragon Banker is eagerly taking bets from the ground. Now that the Bank of Neoxian is widespread throughout the Splinterlands, he is attempting to bring back the old ways of gambling, prescribed by Helio himself. 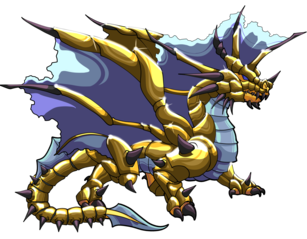 Well aware that he is making a scene, the Golden Dragon executes a beautiful barrel roll, positioning himself directly above the fleeing Pegasus. In a swooping dive nearly too fast for eyes to see, the great Dragon falls upon the Pegasus. A small puff of white and red momentarily fills the air where the strike took place, then begins sprinkling its shower of flesh and feathers slowly to the ground. The delegation of City Dragons is approaching from a distant dune. These smaller, less-fortunate Dragons are not blessed with the power of flight, so they must make a pilgrimage from the safety of the Centrum walls. 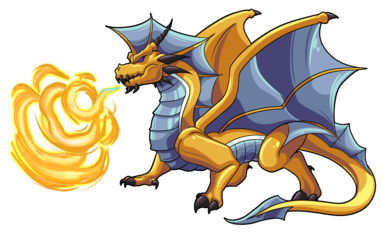 At the last Congress it was decided that these Gloridax half-breeds would be included in all future assemblies, even though they are not true Dragons. Still, the very existence of Dragon Congress must be kept secret from Suam Khepri, the self-proclaimed ruler of the Gloridax. She knows nothing of the truth of Helio, but must be allowed to think that she is in control. The light from the sun is suddenly obscured by the approach of a Dragon that none of the others have seen before. A rush of cold fills the air as the massive talons of the Black Dragon meet the sands of Draykh-Nahka for the first time. Neoxian, a large Dragon himself, stares up at the newcomer in sheer wonder. None of the assembled have ever seen a Dragon so large and terrifying. This could only be Rojak, the famed Dark Eternal Dragon. The nameless Golden Dragon comes to a soft landing in the center of the great circle. The Lightning Dragons have finally settled down; they are shocked and somewhat subdued at the sheer size of the Black Dragon before them. All Dragon eyes look to the sun, which has begun to be partially eclipsed by the Golden Moon. This combination of the Golden Sun and the Golden Moon happens at the turn of each four hundred years, calling the Dragons to Congress. The air itself seems to turn gold as the eclipse nears completion. The Dragons watch with reverence as the great Helio speaks to them through the Golden Eclipse. Finally, the Moon passes over the Sun, signifying the end of the ritual. All Dragon eyes are on the nameless Golden Dragon, who is preparing to speak. The Ninth Dragon Congress is ready to begin. Artwork by @candycal and Serge! Edited, formatted, and text dividers by @carrieallen. The Team is currently building up to launch a Kickstarter for the 150+ page campaign guidebook. Keep on the lookout for announcements and more inside scoops about the Splinterlands. You just got a 0.71% upvote from SteemPlus! Amazing work here, the story is great. I look forward to how the lore and the game can work in creating some amazing dynamics.